Ah ha ha ha. 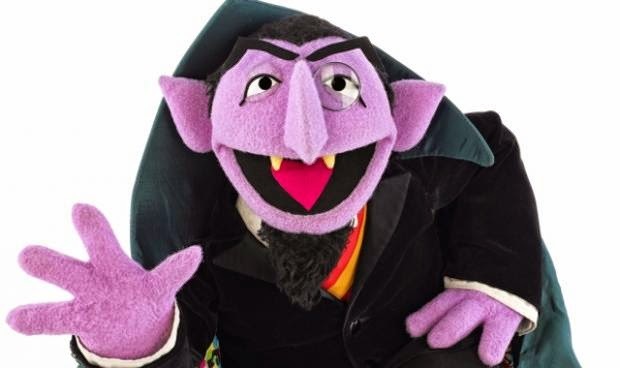 That's all I can remember of Count Dracula from Sesame Street I'm afraid. Not too sure of his intro but anyhow this leads me nicely into my thoughts for a revolutionary new diet. I should ditch The 1970s Diet and call it The Letter C Diet. Millions will rush out and snap up my simple, no nonsense and rapid weight loss words of advice in paperback or hardback. I might even see if I can get a picture of Count Dracula on the cover. What do you reckon? Actually what am I talking about? See, this is what happens when you write a blog post at 10.00pm. It was Cookie Monster who did the letter of the day on Sesame Street. He is perfect for this post of which I will explain below. 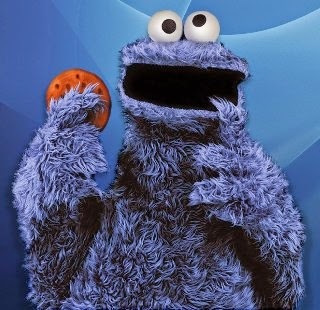 C is for Cookie Monster and most things that make you fat! I wrote, what seems like ages ago and most probably was, giving up the three 'c's. If I can recollect it was crisps, chocolate and cake? Well, I revisited this on Monday last week. Yes, my friends a whole 7 days. I have not touched a crisp and I have had no desire to eat them. They were sneaking back into my lunch alongside my ryvitas and popping into my mouth without any consideration whilst dishing them up to Buddy at lunch time. In fact, I think I consumed 3 x child frazzle type packs in one day which equated to just under 300 calories. Now, its all well and good logging it and saying its part of your allowance but ultimately I think I have a crisp addiction. I am a crisp addict. I've said it. I decided I need to go cold turkey with the intention of giving them up until it was my holiday but now I'm just like actually I'm just going to give them up. I'm sure there's lots more - feel free to add any C's to my list. What do you get if you eat lots of C's in your diet. CHUBBY! Another C. Now this may sound basic but I reckon if you cut out the letter 'C' from your diet then you will lose weight instantly! Now, I don't drink Coke anymore, the chinese/curry aren't really an issue. I'd like to say I eat lots of cauliflower cheese but my roast dinners are piss poor and I can't see anyone making me this fab dish for me anytime soon. I've cut out crisps and also cookies as from today. I don't eat lots of them but I always manage to find a way of eating one at the weekend when the husband buys those giant ones for the kids. Chocolate mmmmm not a massive problem, having said that I did have a 99 flake Corneto at the weekend! Oh dear, I do have problems don't I. I have been known to accept a slice of homemade cake (especially on my Wednesday lunch date with Em) so that's another one on the list that needs to be cut out. Come to think of it do I eat anything that doesn't start with the letter C? Mostly I'm feeling good that I've just said no more on the crisp front. I'm excited to add cake and chocolate also. Cream - I should go cold turkey also. I've been having a dash and I mean a dash on my strawberries at lunch time. These are all Calories that just add up - I'd say at least 300 a day. Well that's my ground breaking decision pre holiday. My stomach has gone down a bit already and I will take a bikini shot this year also and you can tell me what you think. I haven't weighed myself for ages but I reckon a couple of 1lbs off. I managed two workouts last week the swimming and the kettlebells which I think I told you about. More news later this week on kids, the NHS and more!